More than 40 years of Rexroth experience in the chemical industry give you access to a depth of drive application knowledge. By listening closely and applying it to your challenges, we help you get the most from each of your processes. In addition, we provide solutions that minimize risk and maximize peace of mind throughout your drive system’s life cycle. When it comes to chemicals, the success of your mix often depends on the strength of your method. 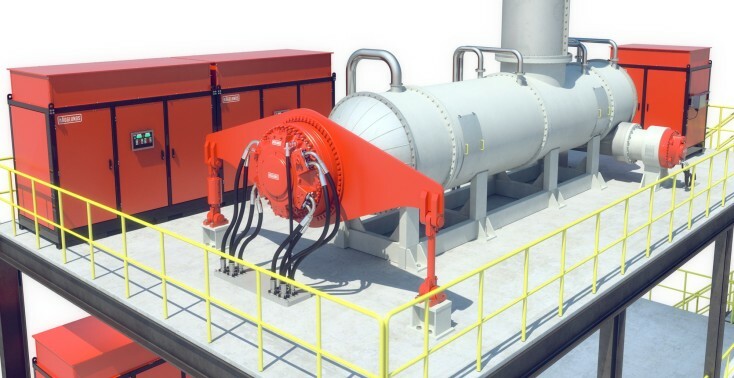 In reactors, mixers, agitators and more, our Hägglunds hydraulic direct drive systems have given producing companies within the chemical industry an edge for over 40 years. With their unique blend of characteristics, they can improve your end products as well as your processes. In fact, Hägglunds solutions now take you further than ever before. Through the optional connectivity of Hägglunds Inside Intelligence, you can add condition-based monitoring, analytics and direct access to service expertise that further boost your productivity. Hägglunds drives are space-saving and lightweight solutions with torque and speed capabilities far beyond the expected. With no foundations or gearbox, they supply exceptional power straight to the driven shaft. With gearless Hägglunds solutions, you can easily optimize the output and quality of continuous processes. Soft-started without any ramp times, they can be run at any speed within their range and switch effortlessly between forward and reverse. Torque – including torque well above nominal – can be supplied at reduced speed and without time restriction, so that you can make optimal use of the installed electric power. Hägglunds drives are insensitive to dirt, dust and moisture, but they also protect your equipment as a whole. Hydraulic pressure limiting creates an infinitely adjustable safeguard against torque stresses, while an extremely low moment of inertia offers protection at dynamic loads. You can take blockages and other overload situations in stride. With Hägglunds solutions, you can keep standstills to a minimum. Multiple pumps, for example, let you implement redundancy within the drive system. You can also start quickly after an emergency stop or power failure, because the electric motor has virtually no load and maximum torque is available from zero speed. Combining a Hägglunds system with your existing control systems is simple, both through different fieldbus cards and through optional interfacing with the drive’s control and monitoring unit. Process-dependent speed control and even torque measuring are convenient and cost-effective to implement. Hägglunds hydraulic motors are EX-proof from the start, complying with ATEX Equipment Category II G/D and Temperature Class T4. Drive units can be placed outside the EX-classified area or supplied in an EX-proof configuration for Equipment Category II 2G/3G and Temperature Class T3 or T4. Besides being prepared for a tough production environment, Hägglunds drives can make it easier on your workers. Their gearless transmission of power means reduced noise levels in the production area.